Summertime puts me in a mood. 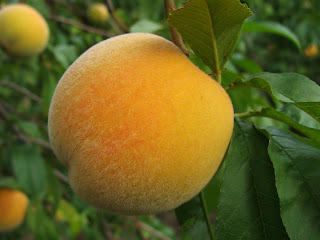 When this mood hits there is little else I crave more than a fresh peach. I want to feel the soft, itchy fuzz. I want to wash it off, shake off the water and eat it. I want my face and hands to get messy with peach juice. There is a basket of peaches on my kitchen counter. They look so nice and are so tempting. I want one of those peaches. Every time I pass by I eye them. When I'm close enough I reach out to feel them. Then the disappointment hits. My fingers tell me these peaches can't be enjoyed yet. It isn't time yet. I wake up the next morning. I see them. I feel them. It still isn't time. Not yet. In time I will enjoy them. Just not yet.